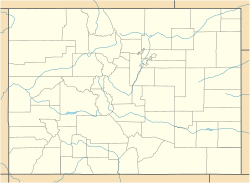 Location of Ellicott in El Paso County, Colorado. Ellicott is a census-designated place located in El Paso County, Colorado. The population as of the 2010 Census was 1,131. The U.S. Post Office at Calhan (ZIP Code 80808) now serves the Ellicott postal address. Students are served by the Ellicott School District 22. Ellicott is located at 38°50′18″N 104°23′13″W﻿ / ﻿38.83833°N 104.38694°W﻿ / 38.83833; -104.38694, at the intersection of State Highway 94 and the Ellicott Highway. The town is approximately 24 miles away from Colorado Springs. ^ "Geographic Names Information System Feature Detail Report". USGS. Retrieved 2007-08-15. ^ Colorado Trend Report 2: State and Complete Places (Sub-state 2010 Census Data). Missouri Census Data Center. Accessed 2011-03-08. This page was last edited on 7 October 2018, at 01:30 (UTC).